Welcome to our Monday cartridge showcase. We have a wonderful showcase for you. This week we are featuring projects from Country Life. 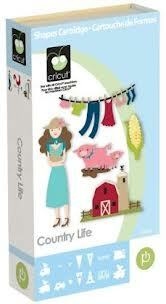 The Country Life cartridge features Two layers, banner, font phrase, and shadow tabs. It is full of great cuts and useful for many occasions. 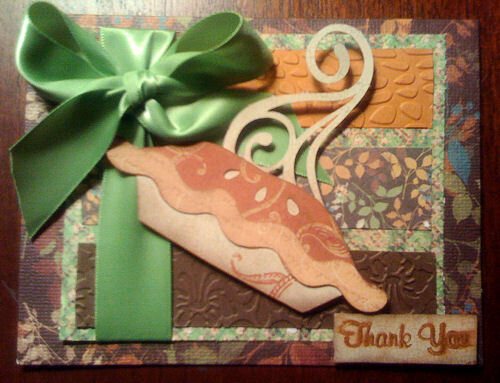 Jen's first project is perfect for this time of year. Nothing like fresh strawberries right out of the garden. YUM!!! 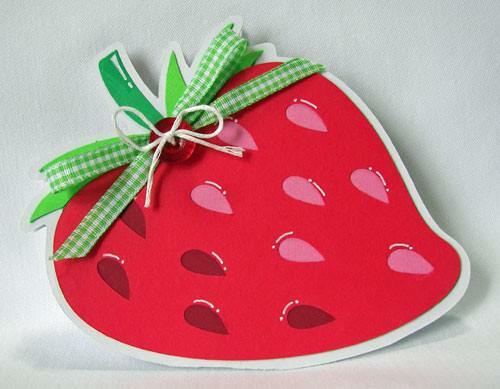 Jen made this cute strawberry shaped card by welding 2 strawberries together. 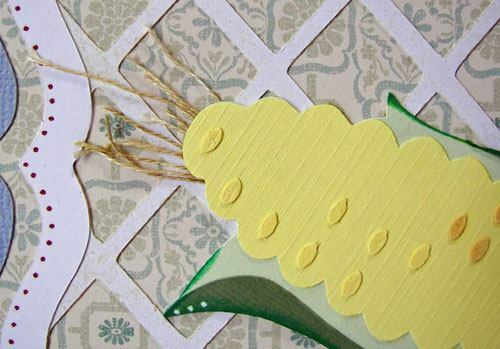 To add texture and dimension, she added these cute ribbons topped with a red button and twine. This is so adorable. Now, just take a look at the inside of the card. Jen could not have added a better sentiment! So cute and so perfect!! Jen's next project is a wonderful framed project. 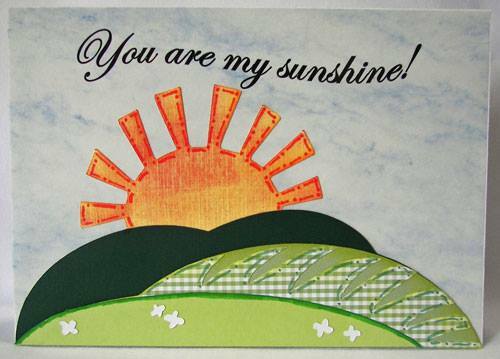 She is making a set of these. The pretty background lattice frame is cut from the French Manor cartridge. Jen topped it with the pretty corn. And again, I'm thinking fresh from the garden. There is nothing better than Silver Queen Corn. And Jen has certainly captured it here. 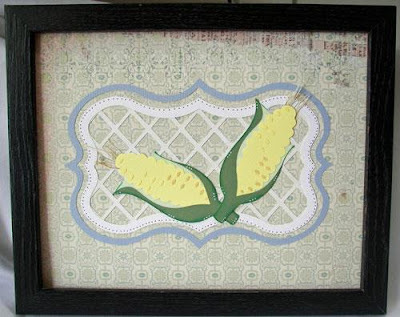 Jen used some embroidery thread for the cornsilk. Just perfect. Now for one of the happiest cards ever! This 5x7 sunshine card makes me want to start singing!! Great cuts and wonderful papers. Thanks Jen for this awesome showcase. You can visit Jen's blog. HERE. 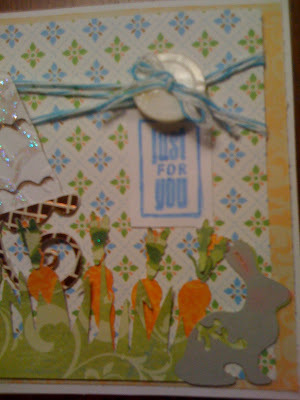 Charlotte's first project is a Thinking Of You card that can be used for many occasions. 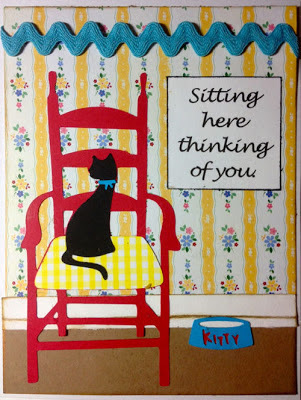 The cat in the chair is from the Country Life cartridge. The little bowl of milk is from the Meow cartridge. A little Ric Rac was added for some texture. And the sentiment was computer generated. 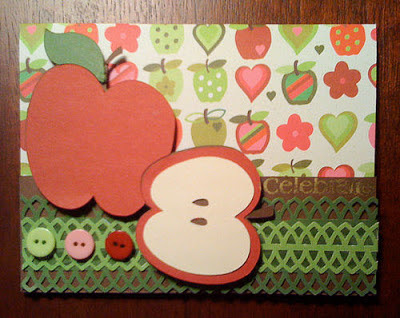 This next card is all about apples and what you can do with them. 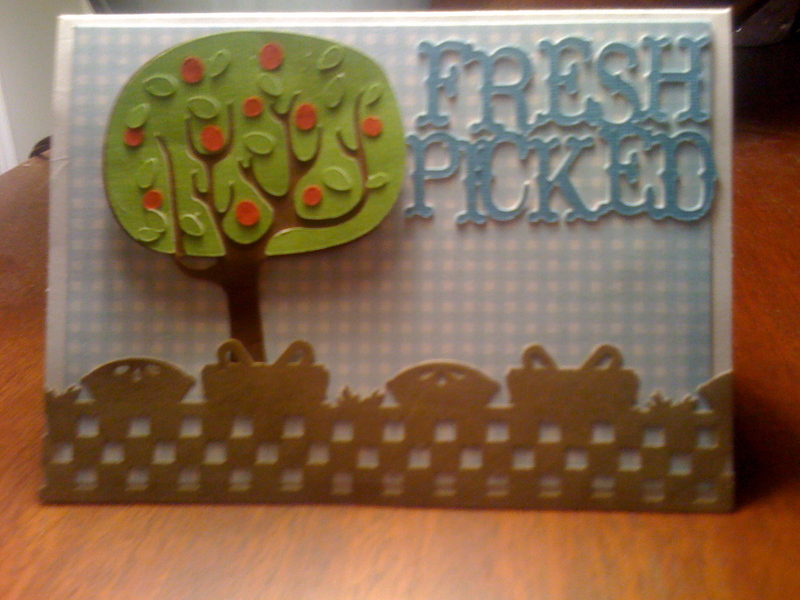 The apple tree and sentiment are from the Country Life cartridge. The border was done with an EK Success border punch. 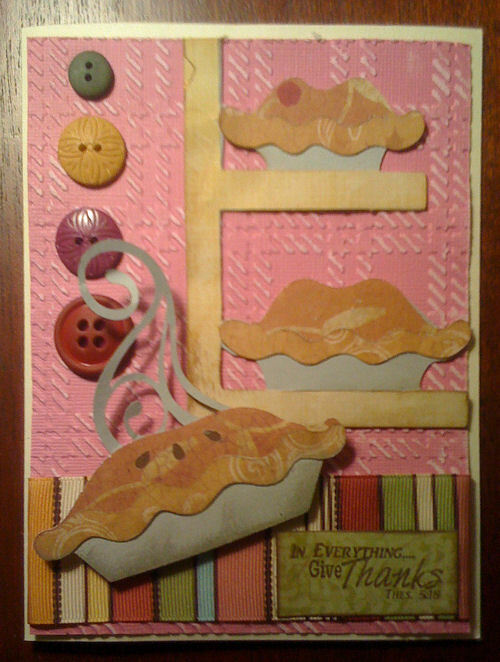 The apple, pie, and rolling pin are also from Country Life. The tablecloth was made with an EK Success border punch. 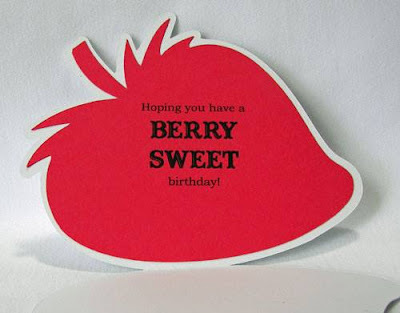 Here is another card using the same apple. Don't you just love to see cuts used in different ways. For dimension, three little buttons were added. This pumpkin pie is a favorite cut from Country Life. The fall colored papers and pretty bow make this a perfect card for Thanksgiving. 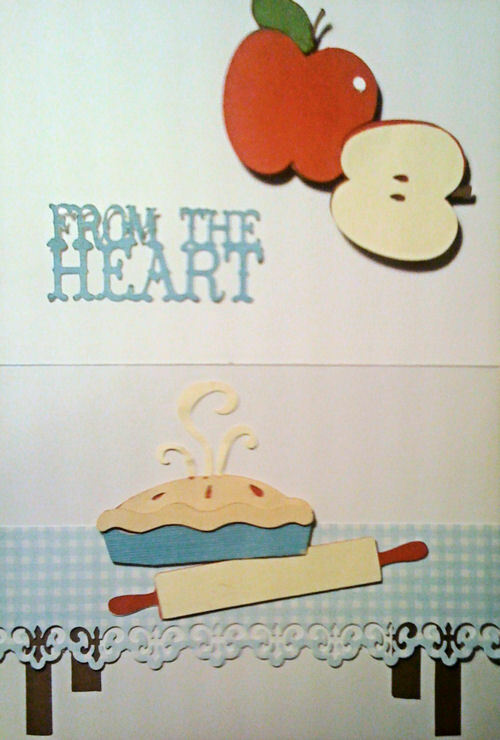 Another card using the pie cut. The buttons were added to bring out the colors of the ribbon. 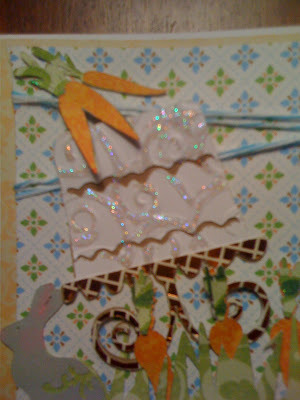 This carrot cake birthday card was made using the carrots from Country Life. 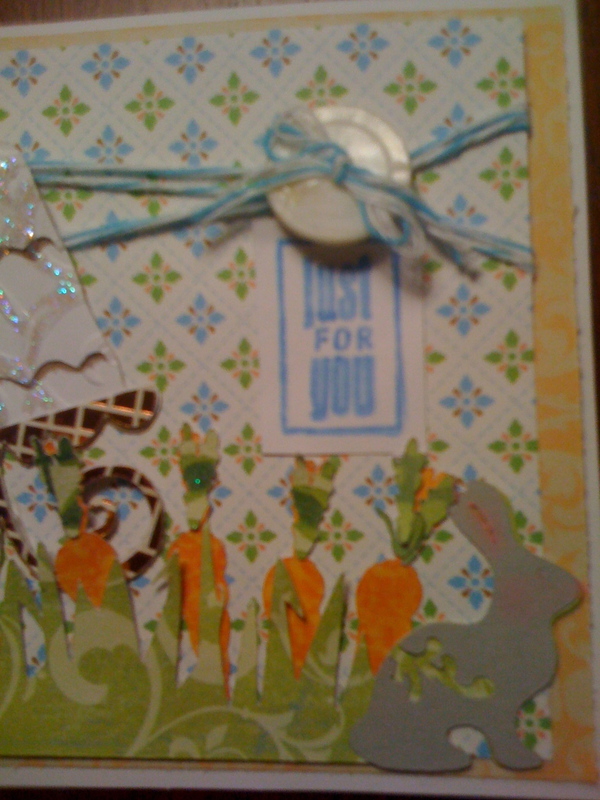 The rabbit is from the Gypsy Wanderings cartridge and the cake is from Sweet Treats. WOW! I think these two really hit it out of the park! 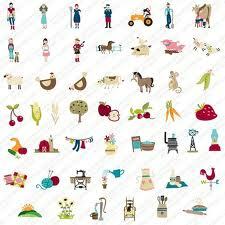 What wonderful projects! Country Life will definitely help you make projects with a ton o' good eats!!!! Please take a moment to visit Jen and Charlotte at their blogs and leave them a little love for such a wonderful showcase! We all love to hear the "atta girls"
Be sure to stop back by tomorrow as our SVG-Cut File designers share some great inspiration with you! Wonderful projects Jen and Charlotte! I love this cart and your ladies have out done yourselves with showcasing it! I have always loved this cartridge and these are all wonderful examples. THanks for sharing.